While the World Cup in India at the end of November seems a long way off now, preparation has well and truly begun for Craig Fulton’s Green Machine. The side will play in 7 match series or tournaments prior to the opening day of the World Cup on November 28th. The first of those tournaments is fast approaching as Fulton’s charges travel to Malaga for an invitational 5 Nations Tournament against Spain, USA, Scotland and Canada. Ireland and Spain clashed no fewer than 5 times last year and 4 times the year before that so the teams know each other well, and Spain edged the most recent 2 contests by just 1 goal. Likewise, the Green Machine came up against Canada 7 times in 2016 and went undefeated in all those encounters. But Scotland and USA don’t feature in Ireland’s fixture list as frequently but both offer threats, with Scotland most recently winning the European Championships II in Glasgow to earn promotion to the top flight, while USA finished above their ranking with a 3rd place finish at the Pan American trophy. Speaking about the opening fixtures of the year, head coach Craig Fulton said “It is really exciting to start preparing ten months out for our World Cup. The last time an Irish Men’s team participated in a World Cup was in 1990 so that shows the level of achievement and how difficult it is to qualify. We have an experienced squad travelling to Spain and we’re looking to build on the tactical and player combinations from a successful 2017”. 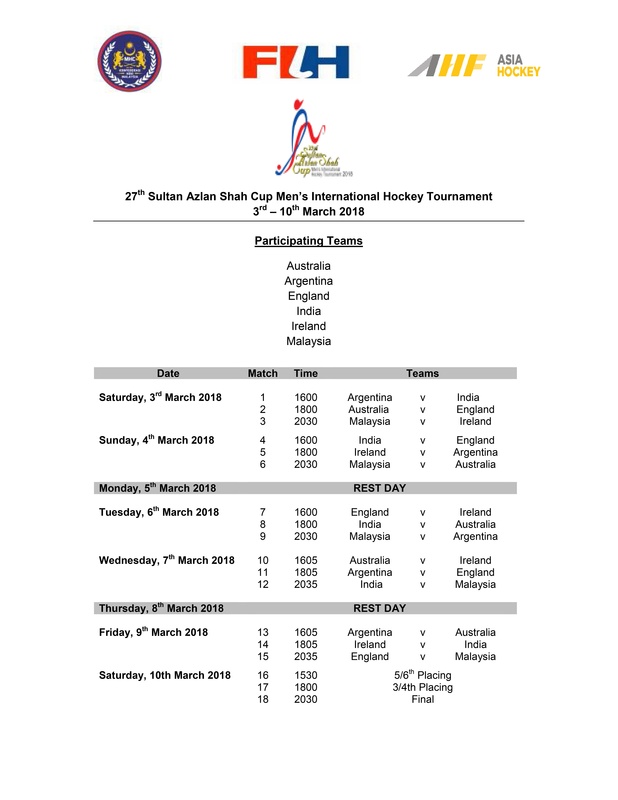 In March, the Sultan Azlan Shah Cup awaits the team as they travel to Malaysia to face some of the world’s best teams in the form of Argentina, Australia, England, India and Malaysia. The tournament will run from March 3rd till 10th in Ipoh, Perak and with the world’s top two teams in attendance it will surely prove invaluable experience for the men in green. (Full match schedule listed at bottom of article). Fulton said “This is a fantastic invite and a really important tournament for us as we will play four teams in the top eight. We will also play an ever improving Malaysian team at home in a packed stadium which is always a good experience for us and our Irish players to learn from and to deal with. We also have the challenge of getting used to the heat, different kinds of food and the travel aspect of competition eight months out from the World Cup”. The first home fixtures of the year will come on May 18th and 19th in Pembroke Wanderers as Ireland host world number 5 side Germany. In the 3 encounters the teams shared last summer there was little to separate them with each winning one tie and then splitting the spoils in a 1-1 draw at the European Championships in Amsterdam. Germany finished the year with a 4th place spot in the World League Finals that saw them beat England and the Netherlands on route to their bronze medal match against India, a feat amplified when considering only 6 of their squad were over the 100-cap milestone. Fulton continued “It is really significant having Germany accept our invite and come to play two matches here in Dublin. We both want quality matches and we hope we can put on a very competitive weekend. We are urging our hockey public to come down cheer us on and support us as we take on the number five ranked team in the world”. 2 home match series in quick succession against France and USA make July a very busy month in the calendar. Ireland will play 3 matches against France on June 28th, 30th and July 1st , followed by 3 matches against USA on July 12th, 14th and 15th, venues for both match series will be confirmed shortly. The last two times Ireland met France it required a penalty shootout to separate the sides and in their last 8 encounters only once has a victory been sealed by more than 1 goal so the series is destined to be hotly contested. The Hamburg Masters will this year be played in Dusseldorf by Germany, Ireland, France and Spain between July 28th-29th. The Green Machine will go into the tournament as defending champions following last year’s tournament victory against Germany, Austria and Spain. The final test for Ireland before departing for the World Cup in India in late November will be an invitational 6 Nations Tournament in Valencia, teams to be finalised. The importance of that tournament is clear as Fulton explains “The Six Nations Tournament in Valencia will be our last tournament before we travel to India .The calibre of teams participating in Valencia will be fantastic preparation 4 weeks out from our opening match. Our goal is to have the Irish World Cup team selected for the Valencia 6 Nations Tournament”. Pools and fixtures for the World Cup in Bhubaneswar have yet to be confirmed but there’s no doubt India will put on a memorable show and it is certain to be the highlight of the year for Irish players, none of whom will have played in a World Cup previously.